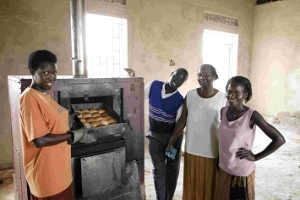 This was a pilot project in Soroti, Uganda, with an aim to provide local bread at a time when only Kampala baked bread was available (this is no longer the case). An appropriate technology group at Nottingham University supported the bakery by designing, fabricating and shipping out a wood-fired oven. Although some bread was produced, the project failed to become established as viable business. Nevertheless, much experience was gained through the process.